In this blog series, we report on the production progress and other news of The Expanse each week. We collect the latest social media and press activity from the show’s production team, cast, and the community. This series is intended to be useful for those who are not able to closely monitor social media, but who want an easy way to catch up on all the latest Expanse updates each week. This week included BIG NEWS: Confirmation that The Expanse Seasons 1 – 3 will arrive at Amazon Prime for worldwide audiences on February 8, 2019! Plus, Amazon Prime Video also confirmed that Season 4 will air in 2019. And, we were thrilled that the crew shared pictures of their wrap party, held January 26, 2019 (see entries in Production below). Two big items this week! The release date for Season 1-3 on Amazon Prime Video and the wrap party. Interesting fact. Production does not stop after the wrap party! The cast still does voice over work and, of course, there is post-production. And, due to planning and timing, the wrap party may not signal the absolute end of filming. Of course, the big news this week is that Amazon Prime Video announced that it will be releasing Seasons 1-3 on February 8, 2019 worldwide. When Amazon made this announcement, it also launched new social media accounts for the show (FOLLOW THEM! ): Twitter , Instagram and Facebook. Folks connected to the show were VERY excited. Amazon celebrated this by releasing this video. The crew posted a ton of pictures from the wrap party. So, here are some social media posts. We think the cast may still be recovering. The Expanse Basecamp production crew recognized the extraordinary effort required when the temperature outside reaches a bitter -24F!! Filming in the winter in Toronto, Canada certainly has its weather challenges and the crew who work to keep it safe and warm are heroes! The office crowd might not have brought the doggos to the office when it was -24F outside, but these pups keep the mood warm. Glenton Richards introduces us to Kovo, Chloe and Marcel. Jeremy Benning, CSC, shows the elegant silhouette of the R2, hard at work on season 4. The equipment involved in producing this show is spectacular. Jeremy also shared the crew setting up a shot (which is vaguely reminiscent of getting x-rays at the dentist…). The Belter accent and speech doesn’t come naturally to all of the actors. Folks like John Fleming train the actors in Belter. Cara Gee (Camina Drummer) and Dominique Tipper (Naomi Nagata) are astute learners. Shohreh Agdashloo (Avasarala) kept busy even during this near-to-show-completion time. The Expanse is always on Shohreh’s mind. She takes note of the futuristic igloo while at the Watergate Hotel! Who hears Shohreh’s tweets in her unique voice? We do. Shohreh was at the Watergate hotel during a trip to honor women veterans at The Fourth Annual Veterans Awards (The Vettys). There was a media blitz announcing the worldwide release of Seasons 1-3 on Amazon Prime Video. A lot of media buzz going on! Green Ronin has news this week regarding its Expanse roleplaying game. They say they are agonizingly close to releasing the PDF of the Expanse RPG. In this blog, Green Ronin discusses its 2019 plans, including details on The Expanse RPG, as well as how to be a late participant in their Kickstarter program. In a late release from last week, The Expanse Book 8 “Tiamat’s Wrath” made Barnes & Noble’s “42 Sci-Fi & Fantasy Sequels We Can’t Wait to Read in 2019.” (Neither can we!) By the way, this post allows you to pre-order a signed copy of the book! 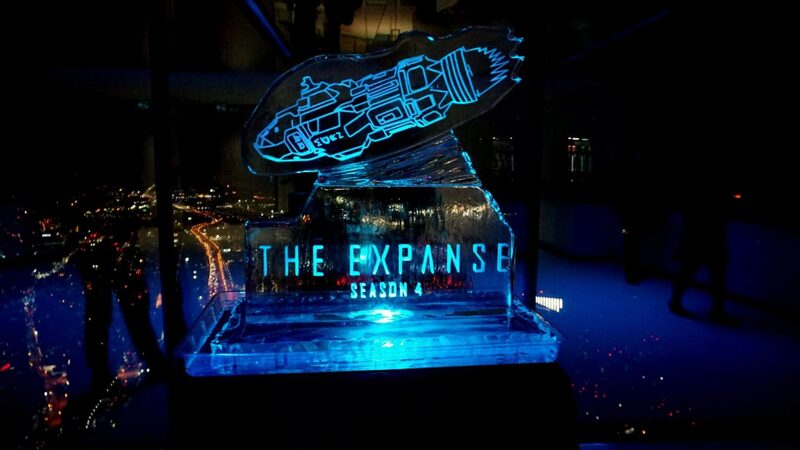 As usual, The Expanse fans were productive while they eagerly wait to watch (or rewatch) Season 3 and in anticipation of Season 4. And, if you missed it, The Expanse Lives is developing a clever little retro asteroid-y game Rock Hoppers, and has a contest running! Check them both out. PearForceOne shared an image of Camina Drummer (Cara Gee) on ArtStation. Jim Coleman shares number four in his 2019 The Expanse art series. He features Jules-Pierre Mao (Francois Chau), one of his favorite cast members! Instagram’s Michael Johanterwage shares his drawing of Naomi Nagata (Dominique Tipper). octoposmic.ink.artwork shared a lovely wood piece of the Roci’s “tattoo.” on Instagram. It’s always interesting to watch customization of video games graphics. Mike Fleming shows off his plane designs here. Enchantment of Eternity provides a YouTube review of “Nemesis Games“, The Expanse, Book 5 (SPOILER ALERT – this book is further than the show has covered). YouTuber Molly Bee reviews Season 1, Episode 6 and Season 1, Episode 7 of The Expanse. While we are huge fans of the impeccable Title Sequence, YouTuber Wailander has reimagined the opening The Expanse Fan Opening | Star Citizen Machinima. Oaktown Pirate, on his Reddit account, has released a clever clip of Meet Joe Black, but in Belter. (And, boy is Brad Pitt young…). YouTuber Doomcock has created quick intro to The Expanse in preparation of the release of three seasons worldwide. If you would like to skip the Star Trek: Discovery section, jump to the 6:30 mark. Paine x MacTane introduce Cocktail 71: MCRN Donnager. The pride of the Martian Navy, the dreadnought that captured the Knight and its crew, but then freed them to clear Mars’ name regarding the Canterbury‘s destruction. Not content with simply producing cocktails, intrepid team Paine x MacTane announced an upgrade to the Memrise LangBelta Phrasebook language course: Female voice files to go with the male voice files for every phrase! Plus a few grammar clarifications. You Too Can Speak Belter in just a few easy lessons! Vote for the Expanse!! Blind Wave reactors are running a survey (with a gargantuan list of choices) to see which shows have the most interest for their next reactions! Let’s show them what we got. Well, that was a jam-packed week! At least for our international fans, the wait for Season 3 is almost over!